In my previous blog post, I gave you tips on how to embark on your post baby weight loss and fitness journey; this week I will give you tips on how to plan your meal, how to diet without depriving yourselves of the many nutrients your body needs to sustain its energy, looking after a baby and breastfeeding. Nature has its own ways to prepare the mother for the breastfeeding stage; breastfeeding helps the mother to loose the extra fat reserves your body intended for the health of the baby. When you breastfeed, your body covert the nutrients you eat into milk your baby eats. If you cut down on your calory intake straight away, your body will hold on to all the stored fat as reserves because it thinks you are going into starvation mode, which slows your metabolism, so the battle to get rid of that fat becomes much more difficult and possibly frustrating. A healthy diet during breastfeeding is one that contains balanced meals and snacks every few hours. Your baby needs to eat every three to four hours which means your body needs the energy to provide food for your newborn. Remember that you gained weight slowly and you should do it slowly. Do not try to do anything drastic to loose weight faster. Instead, work on establishing a mindful approach to weight loss & wellbeing. Try not to stress and avoid obsessing about it, but that doesn’t mean ignoring your body and leaving things till it becomes more difficult. Include foods in your diet that could help speed up your metabolism. Here is a food tip for you that I have learnt while I was studying ayurvedic nutrition and I highly recommend it if you are after weight loss! Have a bowl of cabbage once everyday. Cabbage contains tartatic acid, which restricts the conversion of carbohydrates into fat . Cabbage is one of the world healthiest foods. It is low in fat and high in fiber , it is nutrient rich , fantastic for weight loss and does wonders for the immune system, hair, skin and nails and that’s not everything! It is potent in fighting diseases like cancer , fights inflammation, and is rich with vitamin K.
It helps detox the body, regulates blood sugar and can be used as a remedy for headaches and hangovers! I have picked up a recipe which I love, it is rich with nutrients, tastes great and perfect for the summer! Charred cabbage, ricotta & strawberry salad. 1- Tip the quinoa into a sieve. Rinse under cold water for a couple of minutes. Tip into a pan. Pour in 150 ml boiling water. Cover. Bring to the boil. Turn the heat right down. Simmer for 10-15 minutes till all the water has been absorbed. 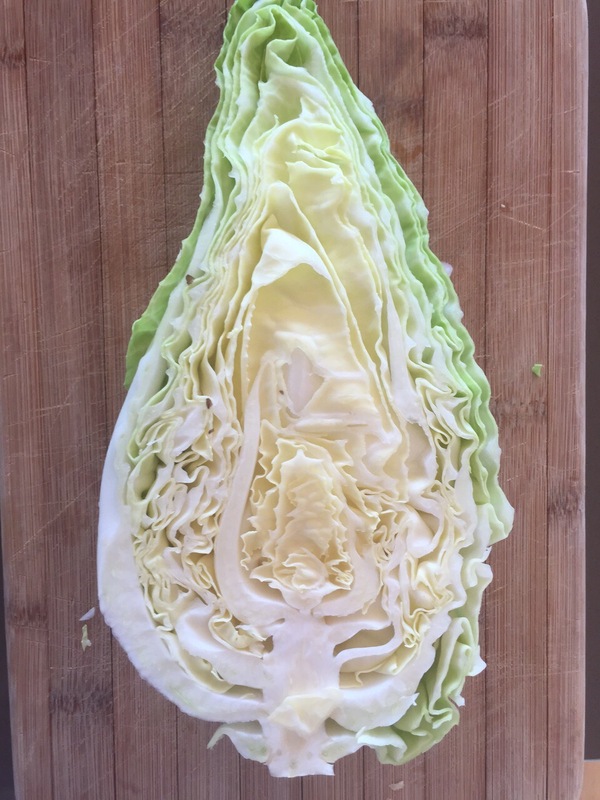 2-peel any loose green leaves off the cabbage so you just have the tight heart. Slice the cabbage into 6 wedges, keeping the bases intact. Rinse them. heat a heavy- based griddle or frying pan over a medium-low heat. Add the cabbage wedges. Dry for 8-10 minutes, turning every so often, till the cabbages are charred all over. Pop on a plate. While the cabbage chars, trim the spring onions. Slice into lengths around 2 & ½ cm long. Add them to the frying pan. Fry for 2-3 minutes till they are light charred. Add to the cabbage. Hull the strawberries. Roughly chop them. Pick the leaves off the mint sprigs. Roughly chop any of the large leaves. Whisk together 2 tbsp of red wine vinegar, 2 tsp honey and 2 tsp olive oil with some salt and pepper to make dressing. 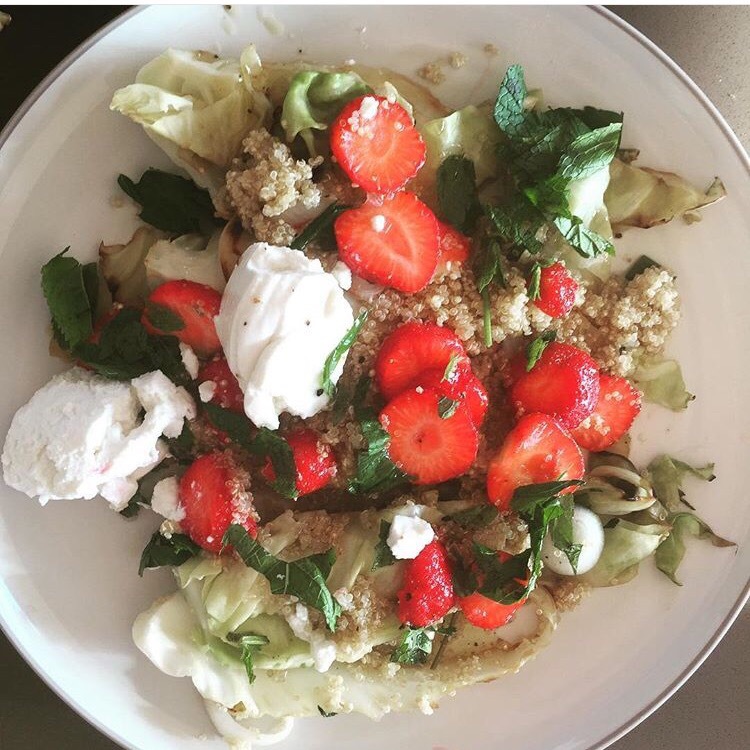 Arrange the cabbage wedges and spring onions on a plate with the quinoa, strawberry and mint. Dollop 2 tbsp ricotta on each plate. Drizzle with the dressing. Serve straight away! Griddling the cabbage gives it a warm, smokey flavor. It’s brilliant with sweet English strawberries and creamy organic ricotta! You’ve got all your nutrients covered in this recipe!